« A quoi s’occupent les milliers de physicien-ne-s du CERN? What’s keeping thousands of CERN physicists busy right now? We made big promises in terms of potential discoveries with the Large Hadron Collider (LHC) but so far, nothing new has emerged. So what are the thousands of physicists involved in the various LHC experiments doing right now? Quite simple: we are inspecting every square centimeter of thousands of acres of new territory opened up by the LHC. Theorists swear: we are bound to find something. They have been refining the Standard Model of particle physics for a few decades now and know what they are talking about. So far, every prediction based on this theoretical description of what’s happening in the micro world of particles has been verified, sometimes to the ninth decimal! The Standard Model is quite simple and rests on two assumptions: first, all matter is made of elementary particles (so far, we have identified three families of quarks and leptons, the building blocks of matter) and second, these particles interact with each other through basic forces: the gravitational, electroweak and strong forces. This is done by exchanging other particles called “bosons” that are associated with these forces. For example, the electromagnetic force, which is part of the electroweak interaction, is mediated by photons. Gluons carry the strong force that binds quarks together within protons and neutrons. The Higgs boson, if it exists, would mediate a new force not yet discovered. The Standard Model seems to be to particle physics what arithmetic is to mathematics: just the first layer of a more complex theory. Most of daily calculations can be done with the basic operations provided by arithmetic, but if you want to do something more complex than shopping or cooking, something like building a house with curved walls and angular rooms, geometry is necessary. That’s about where we stand now: although the Standard Model has answered nearly everything observed so far, we know its equations get unstable at high energy. And high energy is where the LHC brought us. So we are bound to see something happen since we know things will start getting incoherent and break apart. For the last decades, experimental physicists have looked at millions of events, each one being a snap shot of what happened following the collision of protons or electrons in various particle accelerators. This allowed us to explore a large territory but in a painstaking way. With the LHC turned on, it is as if we went from exploring a vast cavern with a small headlight to having central lighting installed in the cavern. Not only the LHC produces more events, allowing us to see in all little corners, but also these events come at a higher energy, enabling us to explore new sections of this cavern never reached before. Right now, the LHC physicists are frantically exploring every single nook and cranny of this space. We can already rule out with absolute certainty large areas where new particles could have been hiding. The Standard Model Higgs boson is not the only new particle we are looking for but there is also a whole zoo of particles postulated under different hypotheses. In case you would like one of these particles for yourself, check out the Particle Zoo site. If something is hiding out there as theorists are convinced (and they have been getting it all right so far with the Standard Model) then we will find it. Meanwhile, the goal is to establish a number of facts that will serve as landmarks in the definition of new models or the retention of existing ones not yet confirmed. Every time experimentalists set new limits, it restricts the number of allowed models, as John Ellis explained in a recent article published in the CERN Bulletin. Eventually, the right solution will emerge, revealing what is this new theoretical layer that must be added on top of the Standard Model. With time, we should be able to figure out how it all works and keep our promises for discoveries! 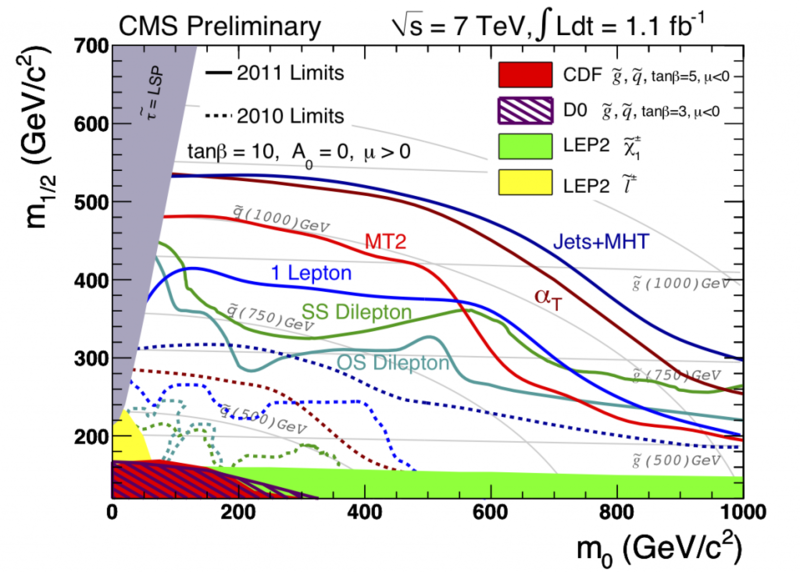 To illustrate this point, here are the limits established by the CMS collaboration while searching for supersymmetric particles associated with a particular model, here the CMSSM model (the Constrained Minimal Supersymmetric Model). Without getting lost in the details, what is worth noting is that all the space below the various curves is ruled out, meaning particles predicted by this supersymmetric model are excluded. One should compare these curves with what had been previously achieved after twenty years of hard work at the Tevatron by CDF and D0 (red and hatched areas) or at LEP (areas in yellow and green). Note also the difference between the results established in 2010 by CMS (dotted lines) and this year (solid lines). The ATLAS collaboration obtains similar results. One can clearly see the progress accomplished by the LHC experiments.